Back to Frontenac again! This time, however, with no hookups. 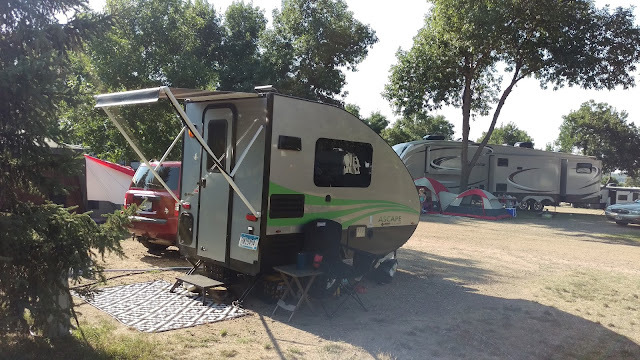 I'm there from Sunday night to Wednesday morning, and they had no sites with electric hookups available for all three nights. And I don't feel like packing up and moving sites, so I opted for a site with no hookups. 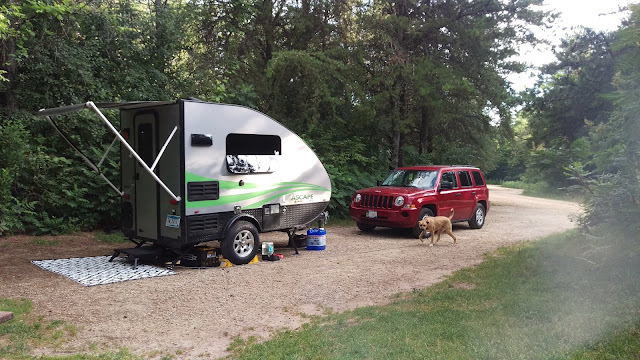 I've wanted to try dry camping anyway in this camper, and now I get to! I specifically reserved a site that faced south since I'm running on the battery, and the solar panel is not movable. That's a downside to having the solar panel mounted where it is, but it is what it is. The sun tracks to the south of us all year long and facing south should give me the most sunlight as possible (when it's not behind a cloud). There are a lot of trees, but it is open enough above to allow the sunlight through. Hopefully it's enough to keep things going until Wednesday. This is also the first site I had to use one of the levelers to get level. The two other times I've been out, the sites have been designed for campers, and was more level. But this, with no hookups, is more of a tent site. There is a nice level patch of ground just off camera to the left for a tent, and the drive-in part is not too off level. Overall, it's a nice site. I also get between 2 to 3 bars on my phone (using T-Mobile). Overall, it's a very good site. The only downside I've found so far is that it's close to the hiking trail, and you hear the hikers as they go through. It's not a bother for me, but I know some people might not like that. It was mainly younger kids out with their parents that were a little loud, and I do like hearing kids having fun. Reminds me of my days as a kid. But there are some people that might not appreciate the noise, and would want to be farther away from the trails. So it's not really a downside for me, but could be for others that don't want to be so close. This is also another trip that I'm still working during the day. It's not perfect, and would be much better having the time off, but we have too much going on at work that I really can't take all the time off I want (I do have enough time on the books to do so, though). Maybe later in the year I'll take more time off to go camping, especially when the leaves start changing. I have a couple places I really want to go to and see the leaves in the falls. And as far as the working during the day and camping in the evening, it gets me out, and is still relaxing. So I am getting something out of it. And in other news, I just got myself a video camera. It's a Sony Action Cam, similar to a GoPro. My credit card is one that gives reward points, and I use it for my everyday purchases, paying it off each payday (every two weeks). The camera is one of the rewards they offer, and since I started this blog, I thought it might be fun to include a vlog every now and then. And since it's an Action Cam, I can also clip it on my hat to take video as I'm out and about, like hiking while camping. It should be a good supplement to the blog. 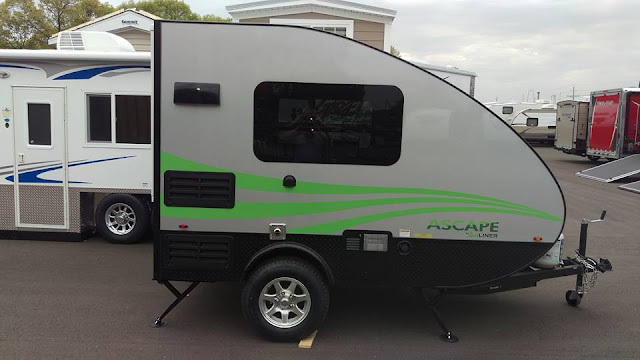 I'm hoping to get a video done this trip, at least an introduction one showing a tour of the camper. 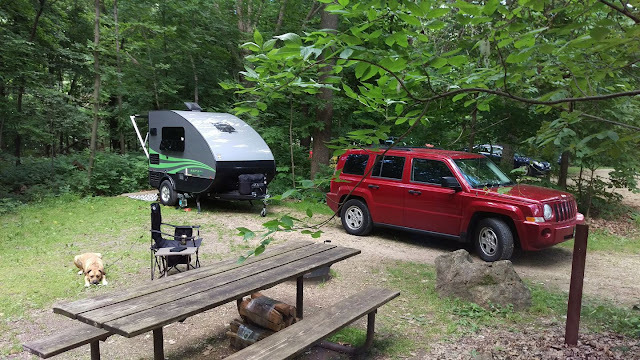 Last, I want to give a shout out to "Patti" on Facebook (not sure if she would want her name posted, so I'm only using her first name) for recommending I use the campground and site in the title of the post. It's a good idea, and I'm going with that format if the post is about a trip.